Any tool that helps with the burdensome task of deciding what to watch on Netflix is always welcome. 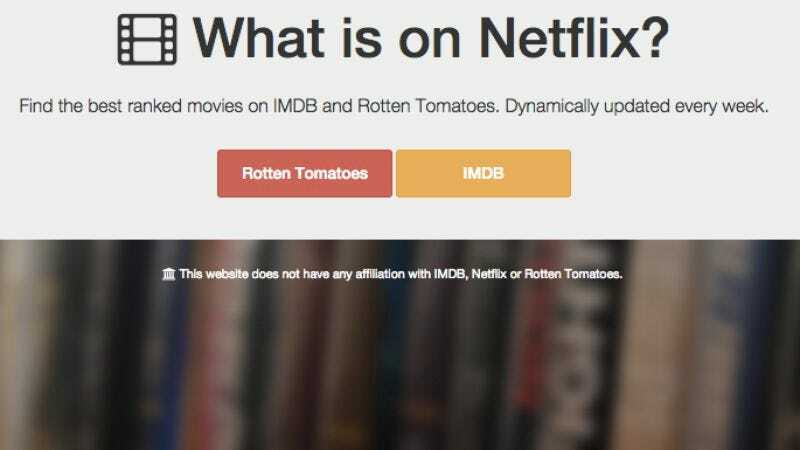 Whatisonnetflix.com takes Netflix-ready streamable movies and sorts them by their rankings on Rotten Tomatoes and IMDB, providing a quick way to pare down the enormous selection of mostly crappy choices into lists ranked and sorted by websites whose users who do that sort of thing for fun. The site is actually updated, too, unlike many of the lists that pop up when this exact question is Googled, only to reveal that Netflix no longer carries many of those good-enough-to-watch titles it once did. Interestingly, the highest-rated films vary from IMDB and Rotten Tomatoes. Selecting the “action and adventure” category in Rotten Tomatoes, for example, shows that the top-rated, on-Netflix films according to that website’s users are Apocalypse Now, King Kong (the original), and Once Upon A Time In The West. IMDB ratings, conversely, give the top slots in “action” movies to Gladiator, Terminator 2: Judgement Day, and The General (the genres provided on the site are pulled from IMDB’s and Rotten Tomatoes’ own genre categories, so they don’t exactly match up). Still, isn’t it a comfort knowing that all six of those excellent movies are on Netflix?